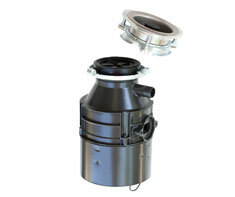 A Garbage Disposal is an electric kitchen appliance that sits underneath your sink. Food that goes down the sink's drain is ground up by the garbage disposal into very small pieces in a slurry, which goes out with the waste water from your home. There are two kinds of garbage disposals: continuous-feed (that operate with an electric switch and have rubber flaps which keep the food from flying back up when it is operating); and batch-feed (that require a cover to be pressed down on them to turn the unit on). Shown in the 'Routine Care' section are the recommended routine maintenance tasks for your garbage disposal. The 'Q & A' section shows answers to common questions. And the 'Articles' section provides helpful articles about your garbage disposal.